KMH Mobile Light Towers. Light The Night. KMH Mobile Generator: Clean Power. Since there are no fuel costs associated with solar, the total cost of leasing our generators or light towers is far less than leasing their diesel equivalents. Since solar stores extra energy and supplies it only when needed, it is far more efficient than diesel. 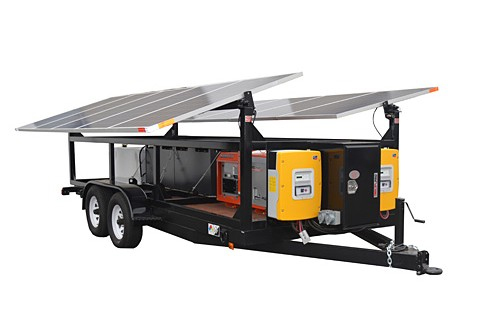 Off-grid mobile solar solutions go anywhere, anytime. Having assisted in emergency and disaster relief efforts, our products and teams are ready for deployment in an instant. Whether you are hosting a festival, working on construction sites around the clock or helping in a crisis, we have what you need. For environmentally conscious customers who can’t compromise on reliability, our product line delivers without sacrifice. Each of our mobile solar generators, light towers and telecommunications equipment is designed to eliminate carbon dioxide emissions. Capable of being setup by a single adult in less than 5 minutes. KMH is committed to environmentally friendly energy solutions that out perform the competition. Contact your local KMH Representative at 888-564-7978 to learn how you can invest in your Solar future and utilize these state of the art resources for your company. Solar Light Rentals – Light The Night! Whether you are working construction in the night, needing campus lighting, hosting a festival or anytime you simply need to light a large area efficiently we have the solar solution you can use with confidence: The Solar Eclipse SCT20 Hybrid LT. The Solar Eclipse SCT20 hybrid light tower brings state-of-the art LED lighting to both local and remote areas. This battery-based diesel hybrid light tower provides 86,000 lumens of light by using eight independently directed LED lights. With an optional video surveillance camera, you can be assured your unit is safe even in remote areas. Construction projects involving night-time operations or security lighting have historically used portable diesel powered light plants. This new generation of light towers has been expanded and these light towers can perform year-round anywhere in the country without any downside to diesel-powered towers. A typical construction project has many light towers positioned throughout a job site to provide working light where needed and to improve safety and security for employees and equipment. 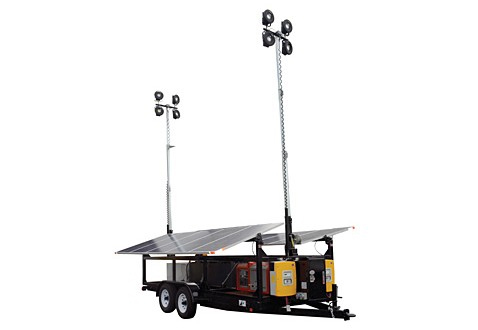 Solar or solar/hybrid-powered light towers can be positioned right where the light is needed because there typically is no or limited noise and no exhaust fumes or carbon emissions during operation. Solar and solar/hybrid light towers use energy-efficient LED floodlights instead of the metal halide lights typically used on diesel units. Solid-state LED lights generate limited heat and most of its power is directly used to generate brilliant white lighting for job sites. Light – anytime, anywhere, for as long as you need it, regardless of the weather. 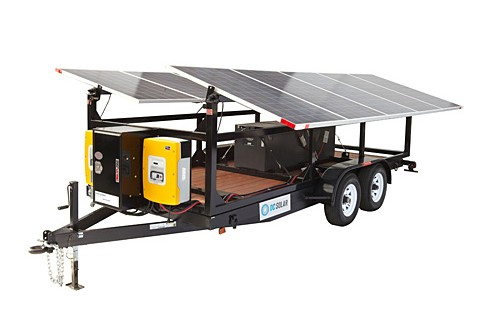 From emergency preparedness/relief, events, entertainment, agriculture and construction wherever you need us to light up the night, our line of the Solar generators meets the off-grid power needs to insure light anytime, anywhere, for as long as you need it, regardless of the weather. The most cost-effective, environmentally friendly and durable outdoor lighting systems available. This is the best way for you to maximize efficiencies and effectiveness in your operations, while minimizing costs and any negative impact to the environment (carbon emissions, noise & light pollution). You get the best return-on-investment, bar none. The Solar Eclipse all-solar product line requires no fuel and is completely noise and emissions free. Each generator is equipped with a battery backup for an uninterruptable power supply. The total cost to lease a solar generator or light tower is far less than its diesel equivalent as there is no fuel costs associated with solar. Solar stores extra energy and supplies it only when it’s needed. Diesel continuously consumes fuel and produces constant energy regardless of load – therefore most energy is wasted. Capable of running 24 hours/day – with or without sun. Provides coverage area of up to 6 acres. Easy to set up and deploy – typically in less than 5 minutes. KMH is committed to environmentally friendly energy solutions that outperform the competition. Contact your local KMH Representative at 888-564-7978 to learn how you can invest in your Solar future and utilize these state of the art resources for your company.